Spray 5-quart slow cooker with cooking spray. 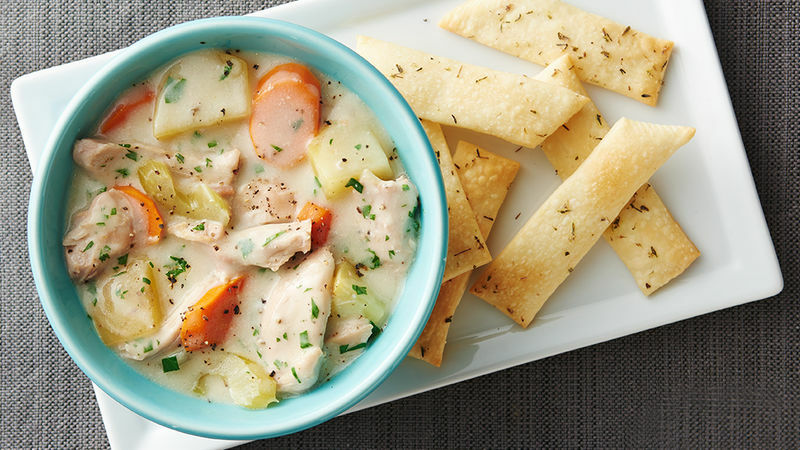 In slow cooker, mix chicken, broth, carrots, potatoes, celery, onion, thyme, 1 1/4 teaspoons salt and the pepper. Cover; cook on High heat setting 3 to 3 1/2 hours or until juice of chicken is clear when thickest part is cut (at least 165°F) and potatoes and carrots are tender. Uncover; using 2 forks, shred chicken into large chunks. In small bowl, beat cornstarch and water with whisk until smooth. Add cornstarch mixture and whipping cream to slow cooker; stir to combine. Cover; cook about 20 minutes or until slightly thickened. Stir in parsley. Meanwhile, heat oven to 450°F. In small bowl, mix melted butter, thyme and 1/4 teaspoon salt until well blended. Unroll pie crusts on 2 large ungreased cookie sheets; brush with seasoned butter. With pizza cutter or knife, cut pie crust into 4x1-inch strips. Bake 8 to 10 minutes or until golden brown. Serve with pot pie. If you like your pie crust crackers cheesy, sprinkle 2 tablespoons Parmesan cheese on top of each crust after you brush with butter, before cutting them into strips. If you like peas in your pot pie, you can add 1/2 cup frozen sweet peas (thawed) 10 minutes before you stir in the cornstarch mixture.